Low noise and high performance make this fan the perfect choice for a broad field of applications. Due to its handy size it is particularly suitable for limited space environments such as Mini-ITX cases, NAS servers or external HDDs. 3500 rpm provides very high cooling performance at an amazingly low noise level of 14 db(A). 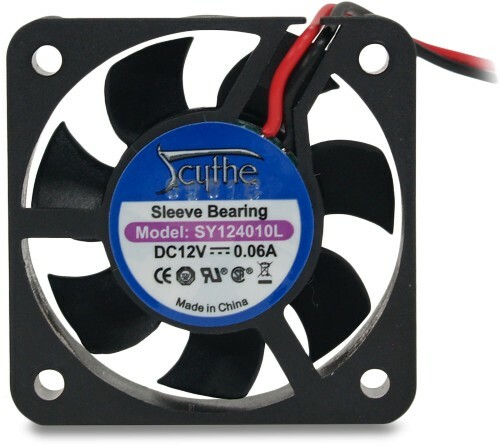 Including 2-pin to 3-pin adaptor, this fan can be versatile for using as a chipset fan, replacement for external HDD case fan, or a replacement fan for removable case. By setting the fan speed to a relatively low level of 3500 rpm, a very quiet noise level of just 14 dBA is achieved. This is a great fan overall only wished it was a dust proof fan that's all. it's super silent too. I bought this fan as replacement for the stock fan of a Via VB8001G Epia motherboard installed in my little SOHO server. The stock fan is really noisy and i couldn't bear with this anymore. As soon as replaced the fan with this product, i could hear the sound of the hard disk instead of the noise of the fan. This is really a great product and at a little price. Thank you Quiet PC. This made an enormous difference in lowering the noise of my RAID array card while reducing its temperature as well. I can't recommend this highly enough.The only gripe I have is that it doesn't come with any matching 12mm screws or bolts, so I had to hunt for some that fit. I installed two of these onto an old Shuttle pc. One for the ATI graphics card and the other for the PSU. I feel like have gone deaf or hard of hearing with these fans. I must admit I was sceptical at first but well surprised. The only thing I hear now is the HDD. Service was brilliant. I ordered the fans on Friday, arrived the Saturday. Thanks Quiet PC!!! At the risk of sounding like an idiot, I actually detached this fan after the 1st installation as I was convinced I had got something wrong - it made no perceivable noise whatsoever. It does work very well, and is totally silent. Brilliant. Plus, 10* to Quiet PC, ordered it 1pm on a Friday, normal 1st class post, arrived Saturday. Very impressed by the service. Ordered six of these to attach to various north/south bridge and RAID card heatsinks. I screwed them down with 3.5x20mm self-tapping screws. Very quiet, and move enough air to keep the heatsinks (which were very hot to touch) much cooler. One has a slight intermittent low buzz, but I can only hear it with the case side off, and the other five are fine. Would have got ten stars if it had a third wire for monitoring, but for cooling chipset heatsinks they're great. In fact I'm about to order some more! I ordered 2 fans during the worst spell of snow (almost 2 feet in 2 days) and freezing temperatures (-18c) I have ever known in the 40 years I have lived in Lincolnshire and I know that Malton was experiencing the same severe weather. Despite this the fans were delivered within 3 days of my ordering which was an amazing feat and I cannot praise the service I received too highly. Using this with my Zalman ZM-NB47J to cool down the northbridge. Used super glue to attach it on the side of the heatsink. It's quiet and feels solid. Perfect.....silenced old noisy heavy fan in TiscaliTV PVR box. I used this to replace the noisy fan in my media player. It has made a huge difference, operates at near total silence. In fact, the only way to tell if it's working is to put your hand round the back! Very highly recommended. I was a naughty boy *ahem* and used this as a replacement fan in a power unit for a shuttle xpc. Apart from the inerrant risks of delving into a PSU, the installation was fine. The fan runs almost inaudibly, and keeps the PSU temp lower than the original fan. Brilliant, worth more than the asking price! I used this fan to replace the standard fan in a Thecus N299. The Thecus is an excellent product but was causing a lot of noise in our living area. The replacement of the cooling fan with this product has now made it inaudible. Fast delivery and an excellent product make this 10/10.